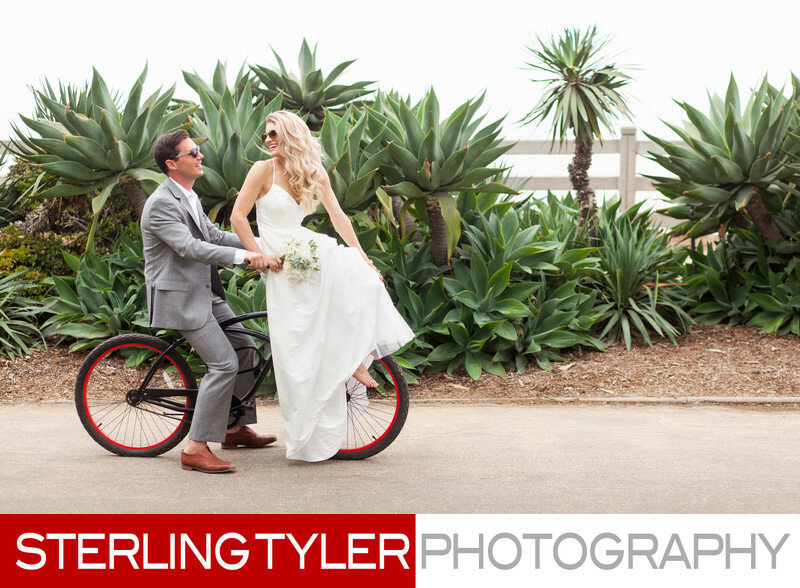 We partnered with The Fairmont Hotel in Santa Monica to great this beautiful image of a bride and groom, out for a bicycle ride on a black beach cruiser on their wedding day. The weather turned out to be a little overcast, which made for beautiful Santa Monica Wedding Photographs. The bride featured a simple rustic wedding bouquet which paired well with the soft green succulents in the background. The grooms light gray suit and brown shoes gives a light, California vibe. The location of this photograph is only a few hundred feet from the famed Fairmont Miramar Hotel's gated entrance on Ocean and Wilshire Blvd in Santa Monica. The hotel is probably best known for its giant fig tree in the valet area, and Fig, the restaurant. Location: Palisades Park Fairmont Hotel Santa Monica, California, USA.